FREMONT, Calif. & LAS VEGAS--(BUSINESS WIRE)--SolarEdge Technologies, Inc. (“SolarEdge”) (NASDAQ: SEDG), a global leader in smart energy technology, announced today that electric vehicle (EV) consumers can now control SolarEdge’s EV-charging solar inverter using the Google Assistant. SolarEdge is one of the first companies to integrate EV charging with the Google Assistant. This news coincides with Google announcing all of the new Google Assistant features and with the SolarEdge EV charging solar inverter on display in the Google Assistant booth located outside of the Las Vegas Convention Center at the Consumer Electronic Show (CES) this week. 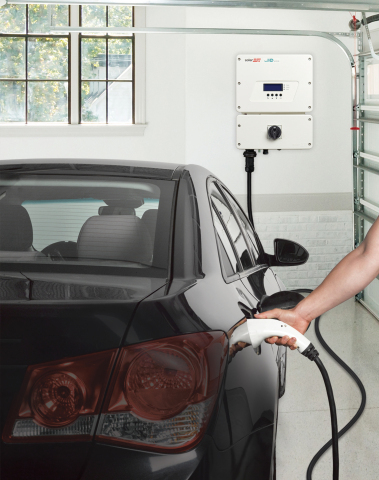 SolarEdge offers the world’s first EV charging solar inverter, which offers up to six times faster charging than standard Level 1 chargers through its innovative solar boost mode. The smart speaker integration with the Google Assistant makes EV charging simpler for consumers and answers demand for smart energy solutions. EV consumers can now control SolarEdge’s EV-charging solar inverter using the Google Assistant.